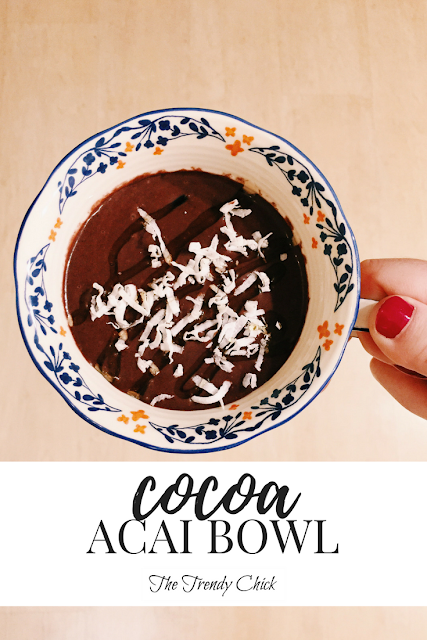 A few weeks ago, I shared a picture of my cocoa acai bowl on Instagram, and I had a few people message me about the recipe. I decided to do a quick little blog post on it so everyone could access it, and because it is a delicious and easy recipe for college students! Plus, this is way cheaper than buying an acai bowl at a stand that sells them, which is always a bonus. coconut, honey, berries, or any topping you want! Add everything into your blender and blend well! First things first, you need to make sure you have acai packets. I found mine in a 4 pack at Trader Joes, but you could probably find some at other stores like Fresh Thyme or Whole Foods too. I also recommend running the acai under some warm water to melt it just a tiny bit so it is easier to blend. If you put it in straight from the freezer it takes a looooong time to blend everything well. You also can totally add in more banana if you like bananas, or substitute honey for maple syrup if you have that on hand! Overall, this recipe is great if you want a filling snack in the afternoon or if you need a quick lunch. I love how customizable it can be too, depending on your ingredients. Do you ever make acai bowls at home? Let me know what recipe you use in the comments!